I started doing the 10-minute quick clean in an attempt to make more time in the day and keep a clean home. I needed to learn how to clean fast because my 3 year old could mess up a home faster than I could clean it. The 10-minute quick clean is more than just a cleaning method it’s a way to organize your entire home in such a way that tidying up never takes more than 10 minutes. The key to this is to make sure your home is organized for your specific needs. I have known a large number of people who lack serious organization skills. They usually drive themselves batty trying to get their homes clean daily. Everything always feels cluttered, messy, or just a hidden mess that they hope no one ever sees. 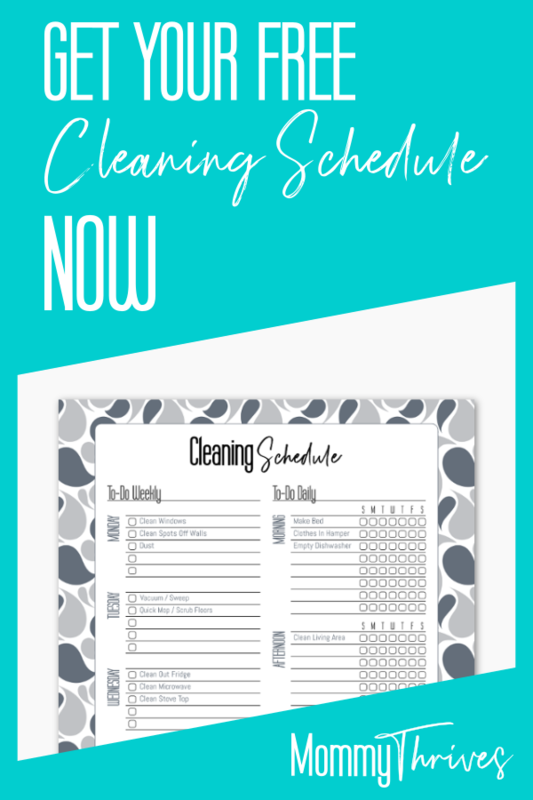 Ditch the cleaning overwhelm and check out the exact planner I use to keep my house decluttered, organized, and clean without losing my mind. If your laundry room door stays shut for fear that someone might see the clutter. If you rarely open up certain closets or cabinets for fear of an avalanche. These are signs that you need help with organization. In order to take full advantage of the 10 minute quick clean you need to make sure that you are completely organized. Every closet and cabinet is in order. Every item has it’s home and it’s in a convenient spot. Subscribe now to get access to my FREE Resource Library, this freebie, and more. In order to start doing the 10 minute quick clean you need to make sure your house is organized. Every cabinet and closet gets full treatment of declutter and organize. This way every item will have a home to go back to. Organize all your cabinets and get rid of anything that is not useful. Make sure you have your pots stacked well, lids in one spot, and the dreaded tupperware stacked and organized. Get rid of extra lids or tupperware without lids. Donate anything you haven’t used in a long time. These things take up space that could be utilized better. Get storage ottomans or a toy box for your living room. Keep only a few toys in the toybox. These are the toys your kid can play with in the living room. The storage ottomans hold extra blankets, books, tablets. Anything that you use often enough to have out but don’t want cluttering up a coffee table. Get your bathroom organized by using containers, drawers under the sink, over the cabinet door organizers and even extra shelving. Make sure everything has its place. When you are done using it make sure it ends up back in its place. I have what I call Junk Spots. Junk Spots are those places where things just naturally gather. If you give a spot for everything you own it’s less likely that the junk will gather there. Identifying your junk spots and what ends up there is an easy task. Look for the places in your home that you are constantly tidying. Desktop, countertop, tabletop, and chair that gathers coats and hoodies. If all your mail ends up on the kitchen table try putting a mail organizer near there. Then all the mail can end up in a basket to be organized and distributed. If dirty clothes end up on the floor of your bathroom, put a hamper in the bathroom to get the dirty clothes off the floor. Hang hooks in a coat closet to hold purses, put extra hangers in your coat closet and encourage your family to hang their coats or hoodies when they take them off. Giving organization to junk areas makes it easier in the end to keep your house cleaner. Check out my post How To Declutter Your Home Fast. Starting daily habits will go a long way in making sure your home remains clean all the time. These small daily habits make the 10 minute quick clean possible. Start a load of laundry in the morning, pop it in the dryer in the afternoon, and fold and put away the clothing in the evening before bed. Unload your dishwasher every morning, load dirty dishes throughout the day, and run your dishwasher at night before bed. Finally, if you pull an item out for use, get into the habit of putting it away after you are done. Don’t just set it down somewhere, put it away. These small habits help your house to look cleaner all day. It makes the 10 minute quick clean completely possible. Everyday in the middle of the day and at the end of the day you will perform a 10 minute quick clean. In the afternoon you will quickly pick up all the toys in the living room and wipe down kitchen counters. Each day you will pick one big thing to clean. You may run the vacuum in the main area of your home, dust, clean the bathroom, or spot clean your windows. Take 10 minutes to do one of these chores. At night you will do a quick pick up of any other toys and another wipe down of your counters. Start the dishwasher, fold the dried laundry and put it away. Once a week you will do a 30 minute to 1 hour major cleaning of your house where you clean everything your bathrooms, floors, and vacuum the entire home. Too often we get dragged into making sure our house is perfect when all we really need is to make sure our house is organized. Once your house is organized cleaning becomes so much easier. I’ve run into the problem of a house getting messy quickly because there was no organization in place. So while people like to complain about clutter and mess the real problem is lack of organization. The only way to make quick cleaning possible is by identifying where you need the most organization help. If you find one item always ends up somewhere it’s not consider giving it a home near there. Staying organized by implementing habits makes the 10-minutes quick clean possible. Remember small tasks during the week and your big clean once a week should only take 30 minutes to an hour depending on the size of your house. Try to do the same tasks on the same days each week till you are in the habit. Are you excited to minimize your daily cleaning time and finally get into the habit of cleaning? Leave a comment below. Follow me on Pinterest for more like this and pin this to your cleaning and organizing boards.